So, there’s a teaser trailer out for the new Star Wars film. Have you seen it? No? Then go and watch it immediately – it’s far more entertaining than anything you’ll find here. I’ll wait. I’ve not really paid much attention to the oncoming horror/brilliance that is Episode 7, The Force Awakens. Sure, I’ve known about for a while (you can’t really spend any time on the internet and not know about it) but I’ve not really engaged with the dribs and drabs of information that are floating around. Partly, this is because I still like to maintain a little bit of mystery. However, it’s mostly because I’m sick and tired of internet commentators wildly speculating about things they know nothing about. (Guys, having a wild guess that turns out to be true isn’t foresight if you made thousands of wild guesses – it’s a statistical likelihood). Did I enjoy the trailer? I’m not too proud to say that I grinned like an idiot for most of it (but then I grinned like an idiot when I saw Optimus Prime ride into battle on Grimlock, so I may not be a good barometer on this one. Oh, and when I found out that Lockdown was actually Nasir in disguise). Sure, the Sith lightsaber looks a bit silly, but there were TIE Fighters, man, TIE Fighters. (It’s great just to hear the ‘Nyyyyyeeeeeee’ sound again.) It also had X-wings. And the Millennium Falcon. Yes, it could well be that Episode Seven is awful, but you know what, right now, it looks pretty damn good, and I’m going to bloody well enjoy that feeling for as long as I can. Battle of Five Armies? You can keep it. Bring on more X-wings! Of course, with Episode Seven now a tangible thing, it got me thinking that it’s time to say a final fond farewell to the Star Wars Expanded Universe (EU). I’ve touched on this a little bit before, but as a recap, the EU is all the Star Wars material that isn’t deemed to be ‘core canon’. It includes comics, books, video games, and more besides, and for years has been a (reasonably) well-managed setting and a continual source of enjoyment for millions of Star Wars fans. In the desolate, filmless wasteland between Return of the Jedi and the Phantom Menace, the EU was the only place new Star Wars stories were told – the only new stories from a galaxy, far, far, away. Now, with the upcoming films seeking to tread the same chronological ground as many of those stories, the EU sits in an odd limbo state, not excised from canon, but not really canon either. As far as I can tell, the message is ‘it’s not gone, unless the films contradict it.’ There are plenty of Star Wars fans waiting to see whether their favourite characters and settings are incorporated into the new vision of Star Wars, but I suspect the outlook isn’t good. Sure, they’re not gone – the stories are still there to enjoy – but they’ve been relegated to that weird purgatory that any comics reader will be familiar with. Pulp Fiction Undead, I suppose we can call them. How do I feel about the death of the EU? Well, I’m a bit conflicted, truth be told. Like any extended IP, there are good bits and bad bits (and aberrations that should never have seen the light of day). Star Wars is undoubtedly at its best when it’s TIE Fighters vs. X-wings, Rebels vs. Stormtroopers, so the further the EU strayed from this formula, the less I liked it. For example, I’ve read almost none of the Yuuzhan Vong stories, chiefly because the writers killed off Chewbacca somewhere in that cycle. So, what bits of the Star War EU worked for me? The Heir to the Empire Trilogy (Heir to the Empire, Dark Force Rising, The Last Command). Written by Timothy Zahn, these were first novels to officially continue the Star Wars story. Sure, there’d been the odd standalone tale featuring the characters before (Alan Dean Foster’s Splinter of the Mind’s Eye, for one) but for decades, these books were Episodes Seven, Eight and Nine. And they’re absolutely brilliant. Let’s just talk about Thrawn for a moment. It’s hard to recall now, but there was a time (before the prequels) when Darth Vader was the gold standard in iconic villains. He was as much the centre of Stars Wars as Han, Luke or Leia – at least until the prequels… happened. It’s nothing short of incredible how easily Thrawn fills Vader’s shoes, whilst still managing to be a completely different character. 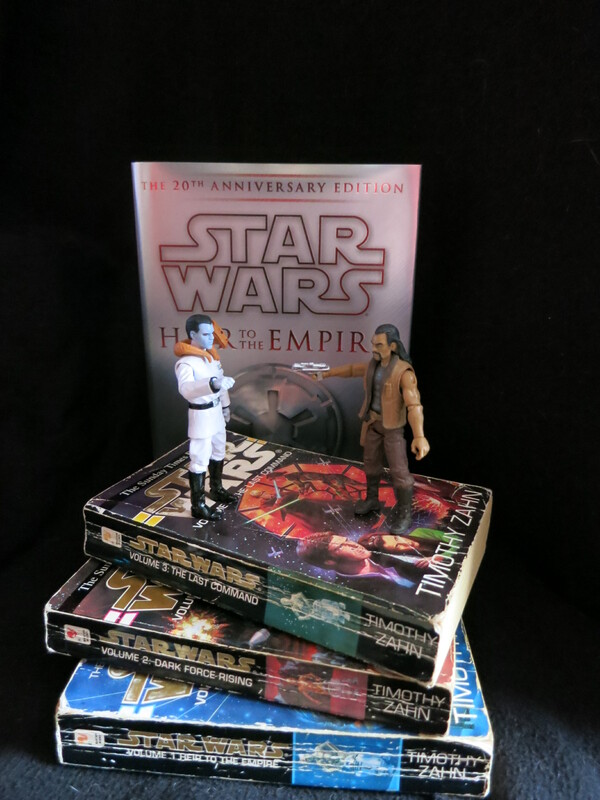 You simply don’t miss Vader in Zahn’s trilogy, and that’s all down to Thrawn. He’s by turns menacing, charismatic and sympathetic, and even now remains a masterclass in how to write a great villain. It’s little wonder that Thrawn is probably the character most fans are hoping escapes from the purgatory of the EU. X-wing/TIE Fighter (PC). Hah! You thought that this would all be books, didn’t you? Well, not only were the early X-wing PC games damn fine starfighter sims, they also told fun stories as well. Granted X-wing’s a little bit dry – it’s pretty much all done through mission briefings – but it weaves in and out of the films’ narratives beautifully, and drags you right into the heart of the Rebel Alliance. TIE Fighter’s an improvement in almost every way (except that you can’t fly an A-wing – boo!) with entertaining storylines that never resort to making you seem evil for evil’s sake. However, what makes these games so important is the wealth of ship design they brought to the Star Wars universe. For the most part, X-wing sticks to the fighters and capital ships that are in the films, but TIE Fighter adds dozens more, and they all fit beautifully into the visual language established by the films. Granted, many of the ships and concepts were borrowed from earlier EU material, but if TIE Fighter wasn’t the first time they appeared, it was certainly the most mainstream (which is a weird thing to say about a flight simulator, all things considered). Part love letter to the X-wing PC game (one of the simulator missions that the trainees face is a particularly vicious early scenario from that game – anyone else remember trying to save the frigate Redemption from TIE Bombers? ), part rip-roaring space adventure, the X-wing series seldom takes itself too seriously, but at the same time works quite hard to establish its place in the wider EU. Stackpole clearly loves the setting, and it shines through again and again. Aaron Alston’s follow-up series, Wraith Squadron, isn’t quite as good, but is still an entertaining enough read. If it suffers from anything, it’s from the fact that the EU was starting to a get a bit overblown by that point, and the continual need to find new big bads for our heroes to triumph over was getting a little thin. Nevertheless, there’s loads to enjoy here. Wraith Squadron is funnier than its predecessor (Kettch the ‘Ewok’ pilot being a standout – no, don’t run off, it’s not what you think), and the casting of the Wraiths as a combined fighter squadron/black ops team makes them just different enough to work. Sadly, the most recent Wraith Squadron instalment, Mercy Kill, is a bit of an insipid mess, so I’d recommend leaving that one alone. When all’s said and done, when the EU was good, it was better than great – it was awesome, full of stories, characters and ideas that have stayed with me for decades. For these, I can overlook the act of senseless wookie-murder, and the recycled ‘it’s like the Death Star, but…’ plotlines (Darksaber, I’m looking at you). Come on, The Force Awakens, you’ve a proud lineage to live up to. If we’re going to lose Thrawn, Mara Jade, Corran Horn, Talon Karrde, Booster Terrik, Dash Rendar, Gilad Pellaeon, Winter, Ton Phanan, Vilim Disra, Ysanne Isard and the rest, let’s make it worthwhile. Posted in Featured Blogs, Thoughts from the Tower and tagged Inspiration, Movies, Star Wars, Video Games.